I've been thinking for some time that I should do a post about insulation, and the cold weather over Christmas and New Year has prompted me finally to do it! When I posted last February about my solar electricity panels, and the previous November about my solar hot water panels, I didn't write then about insulation because I thought the panels were more interesting to people; that insulation was a deeply boring topic; and in any case everyone knew all about it already. On the third reason there, I have been proved to be wrong. I've been really surpised by the number of people who've been reading this blog, or who have talked to me about these issues in other contexts, who have wanted advice on insulation! It really does matter, and it really does make a difference - over a period of about 18 months, prior to having my solar hot water panels installed, I had my old windows replaced with double-glazing; had my cavity walls insulated, increased my loft insulation to about 12" (14-15cm), and put thermal linings in my curtains. This resulted in my gas bills being halved, and that was without turning down the thermostat. 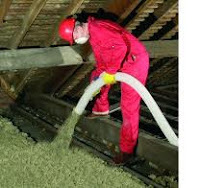 Of all of these, the most cost-effective is loft insulation - it doesn't have to be expensive, and it has a huge effect. There are lots of products available now, some more expensive than others. At the expensive end of the range there's sheep's wool - effective, breathable, moisture-controlling, eco-friendly, supports sheep farmers. You can find out more here. 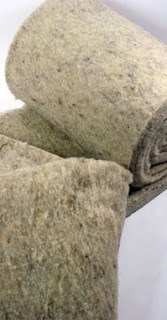 There are other products that blend sheep's wool with recycled polyester, making less expensive and a bit easier to handle. All these products come in rolls. Another 'natural' insulation product is Warmcel, which is made from fireproofed, shredded recycled paper - this comes as loose pellets. It is claimed that this has a 'negative carbon footprint' - that the embodied carbon stored in the product is more than the carbon used to manufacture and transport it. You can also buy 'non-itch eco-fibre' made of recycled plastic bottles - this, too, comes in rolls. The not-especially-eco, most usual and inexpensive material, is glass fibre in rolls. This is horrible stuff to handle - prickly and itchy, and you need to wear protective clothing and a mouth/nose mask. You can also - a bit more expensive - buy it with each roll inside a huge plastic bag. This makes it much easier and more pleasant to handle, and it has one side of the plastic bag made of a heat-reflective material to add to the insulating effect. ﻿and then add wider rolls which you lay over the top, at right-angles to the joists. It's harder to do this yourself, as the easiest method is with blowing equipment (which is how they do cavity walls - more on that next week). 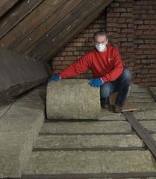 Either of these methods will effectively insulate your loft, but won't give you storage space or anywhere you can walk on it - if you tread on the insulation, you'll end up falling through the plaster-board in the same old way! If you want storage/walking space, first you fill in between all the joists as above. Then, you decide how much area you want to be able to walk on or store things on, and you cover this with a double layer (you need two thicknesses to get enough insulation) of Space Boards or similar. And then you cover the rest, that you don't want to walk on, with rolls as above. You can walk, and place objects, directly on the Space Board, but it's a foam material and will eventually compress and its edges will crumble. You can be very finicky and cover the whole lot with screwed-down hardboard - which is what the manufacturers recommend. What I've done is just lay planks (old shelving, in fact) where I want to stand anything heavy, to distribute the weight; and then I covered all the walking surfaces with offcuts of old carpet to prevent abrasion of the foam. If you already have part of your loft boarded , then you can put the space boards straight on top of the existing planking - and then cover the foam as needed, as above. In my own loft, I've used 'space blankets' (glass fibre in plastic bags) between the joists, and in the areas where I don't walk. All the space high enough to walk in is boarded over, and that's covered with Space Boards. 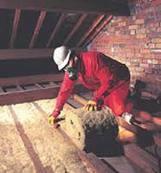 And don't forget to insulate your loft hatch! An area of thin wood can lose a lot of heat into the loft space. Here you see a piece of block foam (actually sold as insulation for underneath concrete floors) - it has a heat-reflective surface on one side, and I've taped all the edges with duct tape, so they don't crumble with repeated use. You can find out more at the Energy Saving Trust. I'll write about walls, windows, etc next week.